Visit Hair By Charlotte for the transformation you have been waiting for. Owner and Director Charlotte has a wealth of experience within the hair industry, from styling the hair of super models at London and Prague fashion weeks to becoming the go to celebrity stylist. 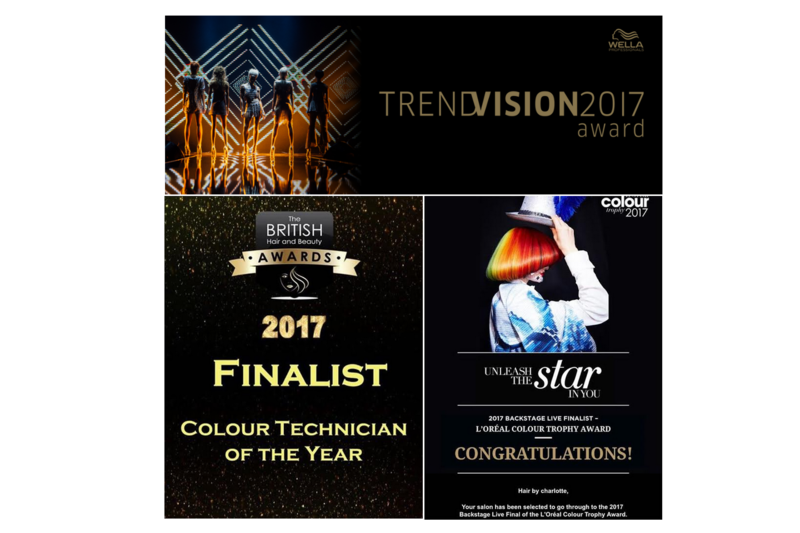 Charlotte is an award winning expert in hair colour and her skills include the unique Hollywood Colour Blend™, as well as balayage and highlights. The dedicated hair and make-up team at Hair by Charlotte will do their upmost to ensure amazing results. Get in touch to book an appointment or arrange your skin test and consultation if you are a new client. I travel from Liverpool to have my hair coloured at Hair By Charlotte. Charlotte has a passion for hairdressing, she is an artist when it comes to colouring and you can always guarantee you will leave feeling like a new woman. She has grown her client bank over the past years and it’s now difficult to get an appointment unless you book in advance . She has also grown her team and makes sure they all work to her high standards. A curly blow will last like no other and Kim and Laura are both masters of this. Been going to Charlotte for the last 4 to 5 years and will never go any where else. She does a fantastic job on my hair and gets my colour right every time I want a change. Her salon staff are so friendly and you feel at ease and come out with great looking hair. Would highly recommend her salon to any one! Went here first time on Saturday. Lovely relaxing atmosphere, staff really friendly not stuck up like most salons. And before and after colour amazing change. Everyone commented on how different, healthy and shiny my hair looks. Really clever to instantly see how how a colouring technique can change a face. Love this place! Fantastic team of girls who are passionate about what they do! Look at the pictures, they speak for themselves!!!! Charlotte is a truly talented lady! I visit lots of salon for my job and see lots of different work… I’m constantly bowled over by her continuing growth and results! Keep up the brilliant work Charlotte! Charlotte has a 2-3 month waiting list for hair appointments and therefore runs monthly set days for new clients to attend consultations. We have other stylists available for apppointments in the salon. No new hair appointment bookings will be made unless you have had a skin test, attended a consultation at the salon and paid the £20 non-refundable deposit. To book in for your consultation please use the ‘Email Us’ form. I went to Hair by Charlotte to get my hair coloured after two years. I have never felt at ease at a hairdressers as I did today. Mel coloured my hair but Charlotte guided and advised throughout my time at the salon (even though she was multi-tasking 100 different jobs!). Previous hairdressers I used never quite managed to cover my greys, but the Hair by Charlotte Team used three different products to ensure I got as much coverage as possible and the best bit was that they couldn’t do enough to ensure it was right and I was happy. I will definitely be booking again to keep on top of my luscious locks. I have found this salon that I’m finally very happy with, after trying so many different ones in the Manchester area. I highly recommend it! Great team and Charlotte is lovely! Fabulous salon I’m so lucky that I live very nearby. Charlotte is amazing, very talented and always full of ideas and inspiration. I’ve never left the salon feeling unhappy with my hair cut or colour. All the ladies at the salon are friendly and make your visit there all the more enjoyable. Great salon highly recommended. After trying hairdresser after hairdresser it’s literally a dream come true finding Charlotte, to say that she’s the best is an understatement. I don’t think she really knows how talented she is. Her salon is friendly where everyone will chat to you- it Has a great community vibe. She’s always on trend with the latest styles and techniques and gives honest consultations and opinions which a rare quality to find. OMG where to start … Been going to Charlotte every week for years and cant recommend her enough, she and her business are cutting edge, professional and caring, no one leaves this salon without a big smile on their face and truly amazing hair. This girl can change any hair into A List. I have been here twice now for my Hollywood Colour Blend. What can say the service is great and the staff are so friendly. I like the fact everything is in one place from getting your hair coloured, cut, a curly blow dry or even getting your make up done. I just think that’s great and it’s reasonable too. Love Charlotte she is great and think it’s a great place, if it was local to me I would be here all the time just for the make up and curly blow drys.